A soldier in the Italian army, Angelo escaped his German captors not once, but twice. 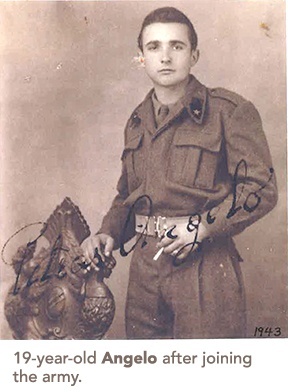 Born in 1924, Angelo was only 19 when he joined the Italian Army to fight against the Nazis. It was 1943, the start of the Italian Campaign and a civil war in Italy, which divided the country between the Allied and Axis powers. The fighting in Italy at the time has been described as “vicious” by several veterans. During the civil war and transition from a fascist Italy, Italian soldiers and civilians were being rounded up by the Nazis and sent to work camps. Angelo was captured twice, and both times managed to escape. Overall Allied casualties during the campaign, which lasted until the end of the war in 1945, totaled over 300 thousand. Today, 93-year-old Angelo resides at Deerwood Creek Care Community in Etobicoke.